Your resource for shipping and receiving for conventions, trade shows, events, as well as receiving freight, shipping, packing and printing services in Charlotte, NC. LOCATED NEAR COLLEGE ST. ENTRANCE. Train Stations: Stonewall + 3rd/ Convention Center. Enter the building through East M.L.K. Jr Blvd (between South College St. + South Brevard St.) as well as South College St. (East M.L.K. Jr Blvd + East Stonewall St.). 10% OFF LARGE and WIDE-FORMAT PRINTING for House Accounts. $2 OFF ONE SET OF PASSPORT PHOTOS. - $14.95 (plus tax) USA = 1 set, 2 photos. - $29.95 (plus tax) = Europe 1 set, 6 photos or Canada 1 set, 2 photos. 2x2 inch. When you’re trying to make a lasting impression with printed materials, you want to consult with a local print expert. That’s where we come in. Stop by The UPS Store at 501 S College St to talk with a real person, someone that can help you design and print that perfect flyer, brochure, menu, invitation, banner or sign. We offer a variety of printed materials and are your local resource here in Charlotte for all of your printing and copying needs. The UPS Store is your professional packing and shipping resource in Charlotte. We offer a range of domestic, international and freight shipping services as well as custom shipping boxes, moving boxes and packing supplies. The UPS Store Certified Packing Experts at 501 S College St are here to help you ship with confidence. Looking for a notary public in 28202? The UPS Store at 501 S College St offers convenient notary services near you. Stop by today to get your documents notarized and check another item off your to-do list. Traveling abroad? Need to renew your passport? Stop by today to get your passport photo taken at The UPS Store location on 501 S College St.
Get easier checkout and flexible billing for your small business. Learn about opening a house account at The UPS Store on 501 S College St. Attending an event or meeting at the Charlotte Convention Center? Let us handle your incoming and outgoing packages. 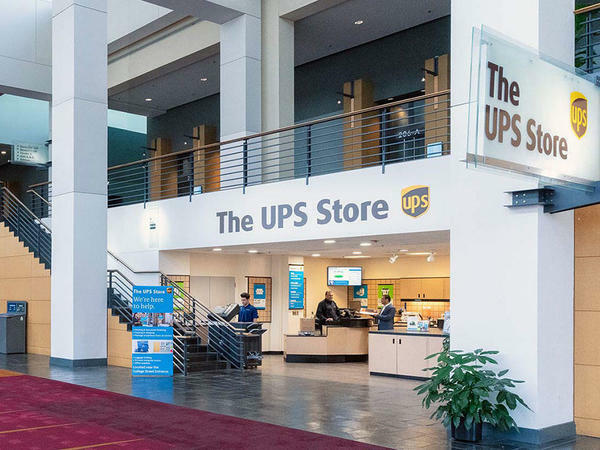 The The UPS Store is centrally located in the Charlotte Convention Center on the College Street Concourse near the trade shows, conventions, and events. - Parking is available at prevailing rates in parking lots and towers surrounding the Charlotte Convention Center. - The NASCAR Hall of Fame parking deck is located at 500 S. Brevard St. and conveniently connected to the Charlotte Convention Center via an overstreet walkway. - The Westin Charlotte hotel also offers more than 1,300 spaces, conveniently located on the corner of Stonewall and College streets, across the street from the Charlotte Convention Center. - Additionally, metered parking is available along many of the main streets in Center City. Some parking garages offer parking after 5 p.m. at reduced rates. - Oversize vehicle parking is available across from the NASCAR Hall of Fame site at the Caldwell Street parking lot. The UPS Store in Charlotte, NC is here to help individuals and small businesses by offering a wide range of products and services. We are locally owned and operated and conveniently located at 501 S College St. While we're your local packing and shipping experts, we do much more. The UPS Store is your local print shop in 28202, providing professional printing services to market your small business or to help you complete your personal project or presentation. We offer secure mailbox and package acceptance services, document shredding, office and mailing supplies, faxing, scanning and more. Everything for your small business, even shipping. Charlotte, NC, Charlotte Convention Center, Uptown Charlotte, Charlotte City Center, First Ward, Second Ward, Third Ward, Fourth Ward. We've got you covered. The UPS Store Charlotte Convention Center in Charlotte, NC offers the following products and services.